Welcome back to the countdown of the top 10 greatest quarterbacks of all time. Part one, guys 10-6, was release yesterday, and some great names were on this list. In case you missed it, or already forgot who was on the list, here’s a recap. With those five guys already on the list, who would crack the top five on our countdown? Utilizing the same format and point scoring system as we did for guys 10-6 (you can find the breakdown of that in yesterday’s blog) to determine guys 5-1. So, without any more delay, time to announce the top five greatest quarterbacks of all time. 5. 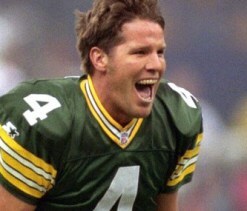 Brett Favre- 43 POINTS: Played 20 seasons (1991-2010). 1 with Atlanta, 16 with Green Bay, 1 with the New York Jets, and 2 with Minnesota. 186-112 overall record. 71,838 passing yards. 508 passing TDs. 336 INTs. 86.0 career passer rating. 12 postseason appearances. 13-11 playoff record. 1-1 in Super Bowls. Career Achievements: 11X pro bowler. 3X AP first team. 3X AP second team. 3 consecutive NFL MVP awards (’95-’97). Won Super Bowl 31 over the Patriots. Holder of numerous records. Most career passing yards, passing touchdowns, interceptions, completions, passing attempts, and regular season wins. Most consecutive starts (321, including postseason). 5,855 post season passing yards. 44 TDs (Second most), 30 INTs (Most). 1990s NFL All-Decade Team. Greatest Season: 1996. 3,899 Passing yards. 59.9% completion percentage. 39 Passing TDs. 13 INTs. Led the league in passing TDs. Finished with a13-3 record. Won Super Bowl 31 over the Patriots. Arguably the greatest gunslinger of all time, Brett Favre was able to change the way a quarterback plays in the 1990s. After getting drafted by the Falcons and spending a year in Atlanta, Favre was traded to the Green Bay Packers for a first round pick (which would become Tony Smith. Yes, THE Tony Smith). Needless to say, the Packers won that trade, as as once Favre took the starting role from Don Majkowski in 1993, he would never miss a start again. The Packers won Super Bowl 31 over the Patriots, made it back the next year against Denver, and ultimately led Green Bay to six NFC Championship games in his tenure. After mulling retirement in 2007, he officially retired in 2008, but then unretired, played with the New York Jets, retired again, then unretired again, went to the Minnesota Vikings, lost in the NFC Championship game to the Saints, retired again, then unretired again to play one more season in Minnesota, had his starting game streak snapped, which finally led him to retire for good. Did that all make sense? Good. Long story short, Favre is the most durable quarterback of all time, and despite all the retirement/unretirement stuff that happened at the end of his career, he will go down as one of the greatest quarterbacks of all time. 4. Joe Montana- 47 POINTS: Played 15 seasons (1979-1994). 13 seasons with the 49ers and 2 with the Chiefs. 117-47 regular season record. 40,551 career passing yards. 273 Passing TDs. Ran for 20 TDs. 139 INTs. 63.2% career completion percentage. 92.3 Career passer rating. 11 postseason appearances, 16-7 postseason record. 4-0 in Super Bowls. Career Achievements: 2000 Hall of Fame inductee. 8X pro bowler. 3X AP first team. Won 1989 and 1990 NFL MVP. 1989 Offensive Player of the Year. 1986 NFL Comeback Player of the Year. Won Super Bowls 16, 19, 23, and 24. Won Super Bowl MVP in Super Bowls 16, 19, and 24. Never threw an interception in a Super Bowl (11-0 TD to INT ratio in the Super Bowl). Second most playoff wins by a QB (16). 5,772 postseason passing yards. 45 passing TDs (most in NFL postseason history). Member of the NFL 1980s All-Decade team. Member of the NFL 75th Anniversary All-Time team. Greatest Season: 1989. 3,521 passing yards. Led the league with a 70.2% completion percentage (5th highest NFL history). 26 TDs, 8 INTs. 112.4 Passer Rating (7th highest in NFL History). Won Super Bowl 23 and Super Bowl MVP. Playoff stats: 800 passing yards. 78% completion percentage. 11 TDs, 0 INTs. Montana played the role of main breadwinner for 49er fans throughout his tenure. Fans came hungry, asking him for more. But no task was too large for Joe Cool. Is down 11 against the high-flying, Randall Cunningham led 1989 Eagles too much? Nah. Joe just decides to throw four touchdowns in the final quarter in a 38-28 victory for the Niners. Is down 28 at half-time against the Archie Manning led Saints too much? Nope. Montana led the way for 28 unanswered points for San Fran and even was the holder for the game winning kick. And is being down 16-13 against the Boomer Esaison led Bengals, with 3:20 left in the game, and the ball is spotted on your own eight yard line too much? Oh, and did I forget to mention that this is the Super Bowl? Well, needless to say, Joe Cool earned his moniker. Montana came to a 49er franchise that hadn’t seen much success before his arrival, and he left as the leader of one of the greatest dynasties in NFL history. His four Super Bowl wins – with no losses – remains a stat that only Terry Bradshaw can match. His three Super Bowl MVPs marks the most of any player in NFL history. Hence, making a spot on this list isn’t too much for Joe Montana. 3. Otto Graham- 49 POINTS: Played 10 seasons (1946-1955). All with the Cleveland Browns. 57-13-1 overall record. 23,584 career passing yards. 174 passing TDs. 44 rushing TDs. 135 INTs. 55.8% completion percentage. 86.6 career passer rating. 10 playoff appearances. 9-3 playoff record. 2,101 post season passing yards. 14 TDs. 6 Rushing TDs. 17 INTs. 3-3 in NFL Championship games. 4-0 in AAFC Championship games. Won the ‘46, ‘47, ‘48, and ‘49 AAFC titles. Won the ‘50, ‘54, and ‘54 NFL Championship titles. Career Achievements: 1965 NFL Hall of Fame inductee. 5X Pro Bowler (‘50 Pro Bowl MVP). 7X first team AP/All League. 1X second team AP/All League. 2X AAFC MVP (‘47, ‘48). 3X United Press International (UPI) NFL MVP (‘51, ‘53, ‘55). 1950s All-Decade Team member. NFL 75th Anniversary Team member. Won 10 straight division titles or championship titles. Greatest Season: 1947. Led League in passing yards, passing TDs, completion percentage, and passer rating. Also threw a 99 yard TD pass. 2,753 passing yards. 25 passing TDs. 11 INTs. 60.6% completion percentage. Won the 1947 AAFC MVP. Won the 1947 AAFC Championship. If Otto Graham isn’t the greatest quarterback of all time, he’s easily the greatest winner of all time. In an era where four Super Bowl titles for Terry Bradshaw and Joe Montana is the benchmark of success in the NFL, Graham was able to win seven titles in just ten seasons. His other three years? He lost in the title game. Were there less teams back in the 1940s and 50s? Yes. But to get your team to the championship game every year is truly astounding and a feat that will never happen again not only in football, but pro sports in general. He also was a five time MVP, but since only three occurred in the NFL, Peyton Manning technically holds the MVP record and doesn’t share it with Graham. His record 44 rushing TDs by a quarterback still holds up today, which is crazy when you think of guys who have come after him like Steve Young and Michael Vick. Graham revolutionized how the game was played, and his effects are still being felt today. 2. Tom Brady- 50 POINTS: 14 seasons with the Patriots (2000-). Still active. 148-43 regular season record. 49,149 career passing yards. 359 Passing TDs. 134 INTs. 63.4% completion percentage. 95.7 career passer rating. 11 career postseason appearances. 18-8 playoff record. Career Achievements: 9X Pro Bowler. 2X AP first team. NFL MVP in 2007 and 2010. 2X Offensive player of the year (‘07 & ‘10). 2009 NFL Comeback Player of the Year. Unanimously voted as the NFL MVP in 2010, the only time in NFL history. Won Super Bowls 36, 38, and 39. Was named Super Bowl MVP in 36 and 38. 75.5% winning percentage (highest career winning percentage). 3rd most wins as a starting QB of all time. Most playoff wins by a QB (18). Currently ranked 7th in career passing yardage and 5th in career TDs thrown. Won a record 10 straight playoff games and a record 21 straight games. NFL 2000 All-Decade team. Greatest Season: 2007. 4,806 passing yards (led the league and top 15 for most in a single season). 50 TDs (second most in a single season), 8 INTS. 68.9% completion percentage (led the league and tied for 10th best in a single season). Named MVP and Offensive Player of the Year. First undefeated regular season when the season was expanded to 16 games. Lost in Super Bowl 42 to the Giants. If you see Brady now, he’s a sure fire, first ballot Hall of Famer whenever he hangs up his cleats. He’s a three time Super Bowl Champion. He’s also married to an incredibly attractive woman. With all his successes, we forget that Tom Brady came uncomfortably close to being a nobody. Brady was buried on the Michigan roster for most of his collegiate career. At one point, he was listed seventh on the QB depth chart and contemplated transferring. When Brady finally got his chance to start, Michigan had another young gun vying for the spot. After his collegiate career, Brady was torn apart by draft pundits and ultimately fell to the 6th round. Throughout all the hardship, Brady never wavered from his dream of being an NFL quarterback. Brady never quit. As it came to be, the rest is history. In Brady’s second season, starter Drew Bledsoe sustained a serious injury, which put the portrayed lanky, unathletic, noodle armed quarterback in the starting job. Brady consequently led the Pats to their first Super Bowl title and played an intrical part in the creation of one of the greatest dynasties in NFL history. Brady’s incredible story only enhances his personal standing in NFL history, but it’s not like he needed any more credentials. Brady’s journey paired with his play easily elicits a spot on this list. Career Achievements: Won Super Bowl 41. 13X Pro Bowler (most for a QB). 7X AP First team. 3X AP Second team. NFL MVP in 2003, ‘04, ‘08, ‘09, and ‘13 (most MVP’s awarded to a single player). 2X NFL Offensive Player of the Year in 2004 and ‘13. NFL Comeback Player of the Year 2012. Currently ranked second all time in wins, passing yards, TDs, and completions amongst QBs. Owns the record for most passing yards and passing TDs in a single season. Most career fourth quarter comeback victories (40). Most 10+ wins in a career for a QB (13). Greatest Season: 2013. 5,477 passing yards (most in a single season). 55 TDs, (most in a single season), 10 INTs. 68.3% completion percentage. 115.1 passer rating. Named NFL MVP and Offensive Player of the Year. Lost in Super Bowl 48 to Seahawks. Greatest Game: 2006 AFC championship game. Colts defeat Patriots 38-34. 27/47. 349 passing yards. 1 TD. 1 INT. 1 rushing TD. 79.1 passer rating. Colts erase an 18 point deficit, the largest comeback in conference championship game history. With a minute left in the game, Peyton managed a game winning, 80 yard drive to take the lead. Colts later win Super Bowl 41 two weeks later. In reality, any 10 of these guys on the list could be the greatest of all time. Heck, when your list starts with a four time Super Bowl winner, that’s saying something in itself. However, after taking in all the factors that we used, Peyton Manning comes out as the greatest quarterback of all time. His numbers speak for itself: 2nd all time in yards, TDs, and wins. He’s not done yet, so he’ll likely end his career at the top of all of those stats. He’s won the most MVPs of not just any quarterback, but any player to ever play in the National Football League. He is one of three men in NFL history to take two different franchises to a Super Bowl (Kurt Warner, Craig Morton). Manning would still have made this list even if he had retired after that career-threatening neck surgery three years ago. The fact he has come back and played at even a higher level is astounding. He broke Dan Marino’s single season TD passing record in 2004, then broke the single season TD passing record again this past season, throwing 55 TD passes to break the then-Tom Brady record. All he needed for his career was a Super Bowl title, and he did that in 2007, beating the Chicago Bears 29-17 in Super Bowl 41. Manning was also named the MVP of the game, cementing his place as the greatest quarterback of all time. Well, that’s it! So what do you think of the list? Anybody you think not make the list that should have? Please feel free to leave your comments below or on Facebook. Here’s the overall standings again. Thanks for reading. 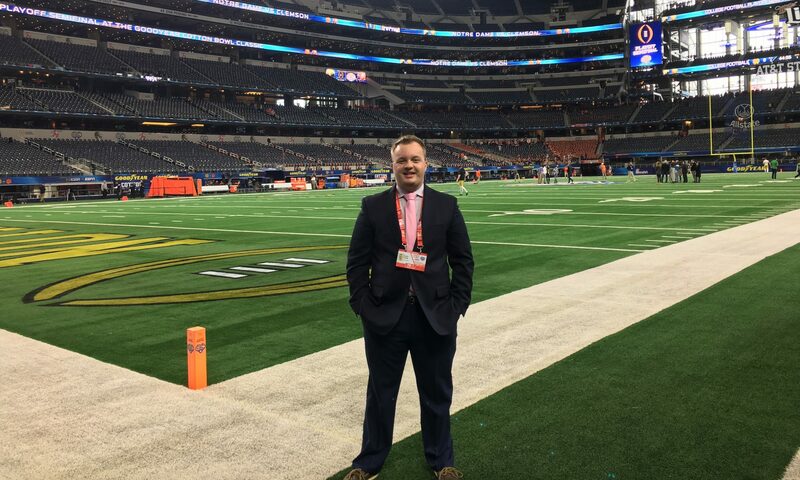 Make sure to check out the other blogs I’ve posted, and stay tuned as I go more in-depth on all the things going on in the sports world. Also, thanks to my co-host Mitchel Summers for being a major contribution to the list. Without him, this would have never happened. Thanks again for reading. This is Game of Sports.